The area around the Makartplatz and the Dreifaltigkeitsgasse on the right side of the Salzach River is dominated by the Baroque ensemble of the Trinity Church (Dreifaltigkeitskirche) and several associated buildings. This ensemble is linked to Prince Archbishop Paris Lodron and his architect Johann Bernhard Fischer von Erlach, who developed the "masterplan" for developing the area. The Makartplatz is the central square at this area and was named after the 19th century painter Hans Makart. Originally, both Makartplatz and Dreifaltigkeitsgasse were called differently. Makartplatz was known as Hannibalplatz, named after Hannibal von Raitenau, brother of Prince Archbishop Wolf Dietrich. Dreifaltigkeitsgasse was called Andreasgasse, since one of the oldest churches, St. Andrä, was at the end of it until 1861. That is rather the ruins of St. Andrä, which had been destroyed at the great fire of 1818 and was newly built as the Kirche St. Andrä on the nearby Mirabellplatz only a the end of the 19th century. The Makartplatz is a busy square and the traffic keeps people from staying there particularly long. However, there are a few things worth noting. Firstly, most tourists stop by for the Tanzmeisterhaus. It was the living house of Wolfgang Amadeus Mozart or rather his father Leopold. The house was first mentioned in 1617 and became home to a dance and etiquette instructor with close ties to the court in 1711. The Mozarts lived here in the late 18th century. The building was partly destroyed by bombs in WWII and reconstructed only in the 1990ies. 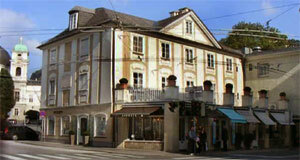 Today, it is a very popular museum dedicated to Mozart, his time and his work. Next to the Tanzmeisterhaus you will see the Doppler Haus, the birthplace of the physicist Christian Doppler. It was built in the late 18th century and is one of the few examples for Classicist architecture in Salzburg. Christian Doppler was born here in 1803. To the opposite you can see Hotel Sacher Salzburg, once founded as Hotel Österreichischer Hof. Here you can buy the sticky-sweet original Sacher Torte chocolate cake. As a Baroque city, all sorts of opera, drama and music were highly valued in Salzburg. Theatre and opera performances were done in Hellbrunn (palace, gardens and Steintheater), Schloss Mirabell (both palace and Heckentheater), the Residence Palace and other sites. The site of today′s Salzburger Landestheater (opposite Doppler Haus) was originally occupied by a ball house, built in 1632. Only when theatre gained an educational dimension, Prince Archbishop Colloredo (the one that employed first Leopold Mozart and later his son Wolfgang Amadeus) provided the funds for the construction of a proper theatre. The construction work started in 1755, but the theatre had to be modernised extensively only a few years later. This was completed in 1791. There were only three rows of seats, which provided space for approximately 30 people. All other space was for standing tickets. In 1816, after the Napoleonic Wars and secularisation of Salzburg, the facility became a public theatre. With Salzburg′s economic recovery in the late 19th century, the Salzburger Landestheater was demolished and re-built in Historicist style until 1893. This was the same year in which the splendid, Historicist Hotel Bristol was built - Salzburg′s first hotel with electricity on the right side of the Salzach River. Famous guests included Emperor Franz Joseph I and Sigmund Freud. At the corner of the Makartplatz, you will find the Primogeniturpalast, built by Santoni Solari for the oldest sons of the Counts von Lodron (the family of Prince Archbishop Paris Lodron). The building burnt down in 1818, later became home to the Borromäum School for boys and in the 20th century first to the Salzburger Marionettentheater and then the Mozarteum Art University. The façade was renovated only a few years ago, but there is in fact not much left of the original palace. The Dreifaltigkeitskirche or Trinity Church was designed by Fischer von Erlach himself. It is the central building of the square and ensemble and serves as the church of Salzburg′s priest seminar. It is known for the Rottmayr frescoes. The square that stretches out in front of the church was designed in the 1950ies. Note the magnolia trees, which are highly popular in Salzburg. When the city′s administration announced plans to re-develop the square according to a design with no magnolia trees, the public outcry resembled a civil war. In the 19th century, the Pegasus fountain from the Mirabell Gardens was at the centre of the square. Moving on at Makartplatz in the same direction, you will get to the Palais Überacker. The Counts of Überacker had their property in Neumarkt am Wallersee, this villa was built in 1732 to have a place close to the court. Originally, the site had been occupied by a villa from 1601. The Palais Überacker was renovated extensively in 1912, but most of the Baroque façade was preserved. Today, you can recognise the building via the post office in the ground floor. Around the corner, along Dreifaltigkeitsgasse, you will get to the Sauterbogen arch. It was built after Prince Archbishop Paris Lodron bought two houses and partly demolished them to create a passage to the Linzergasse - for his family′s palaces. The Sauterbogen was built in 1645; the house on top of it dates back to 1429 and is called Goldschlagerhaus. Around the corner, you can find the tiny Königsgässchen ("King′s Alley"). For centuries, this name was a mock name - because the person in charge with cleaning the public toilets in Salzburg lived here. Another noteworthy building is the Münchnerhof in Dreifaltigkeitsgasse 3, which was here at least since 1347. It was home to the first brewery on the right side of the Salzach. The "Schlammbräu" was even the biggest inn and brewery of Salzburg for a while. Moving on towards Linzergasse, you will enter it at the Platzl Square.